Location: Maybole, South Ayrshire, Scotland. 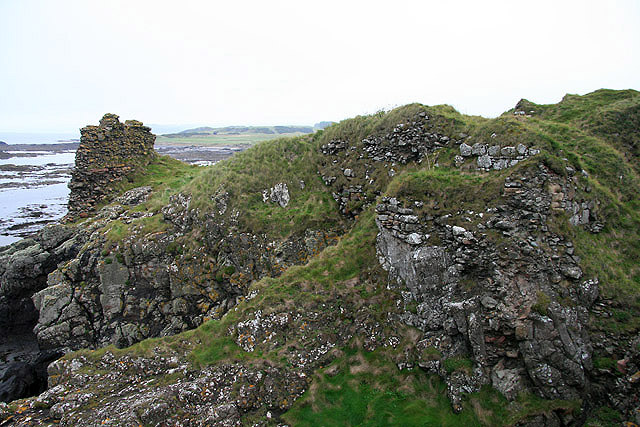 Notes: Turnberry Castle is a fragmentary ruin on the coast of Kirkoswald parish, near Maybole in Ayrshire, Scotland. Situated at the extremity of the lower peninsula within the parish, it was the seat of the Earls of Carick. There is little left of the old buildings today. Turnberry Castle is surrounded on three sides by the sea, and the landward side is occupied by a golf resort. The ruin has been affected by the actions of centuries of severe weather and erosion by the sea, leaving little more than its lower vaults and cellars intact. There are some vestiges of a drawbridge as well as an old portcullis which may have done duty as a gate. By the extent of the rock which seems to be included at the site, the castle appears to have been a fortress of great size and strength. There are also caves that lead out into the sea, that may have served the castle as a harbour. A lighthouse was built on part of the castle's site in 1873, and still stands today.